A while ago, we switched to using the Scrum methodology at the place where I work. 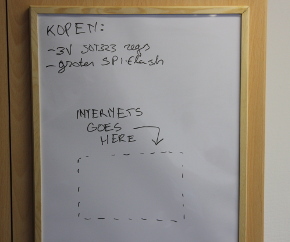 The way we implemented it was with a nice big whiteboard with the status of all tasks on it. For Scrum, it's also important to have a burndown graph, which is a graph giving a visual indication to see if everything is running as planned. The way this graph was updated was pretty old-school: every morning, someone would print it out and stick it to the whiteboard. That seemed a bit old-school to me, so I started thinking: what could I do to replace this? At that time, I just saw someone had reverse engineered the ED060SC4, a 6" E-ink-display commonly used in older cheap e-books. Those display have the advantage that replacements screens are available for something like fifteen bucks on eBay and Aliexpress. E-ink screens like this also are bi-stable, meaning they will keep their state even if power is removed completely. Knowing this, a solution immediately came to mind: Why not take an E-ink display, put it on the whiteboard and make a small controller PCB that can pull graphics from the network and display them? If the display only gets updated once in a while and goes into deep sleep the rest of the time, the battery should last for months. A device like that could be useful at home too: whack it onto the kitchen whiteboard or refrigerator and it can display the weather forecast, bus times, shared agenda points, you name it. So I went on eBay, got me some displays and started hacking.